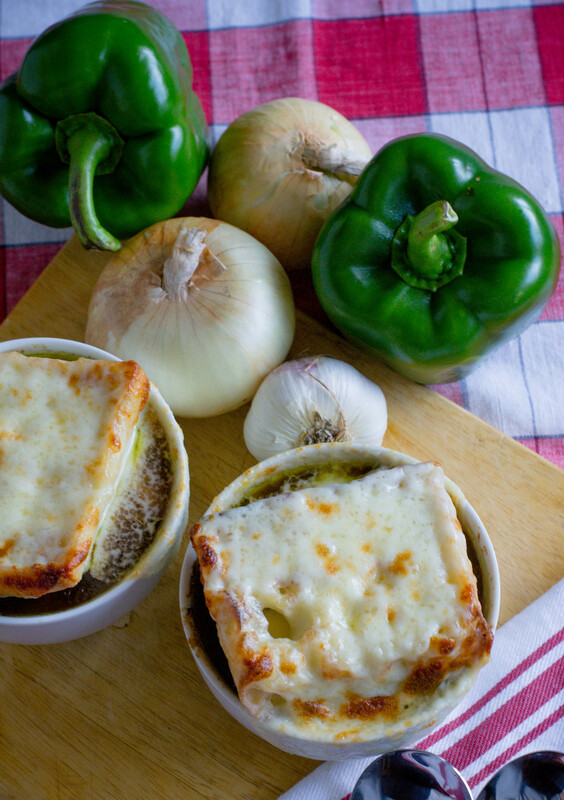 provolone cheese Archives - What the Forks for Dinner? 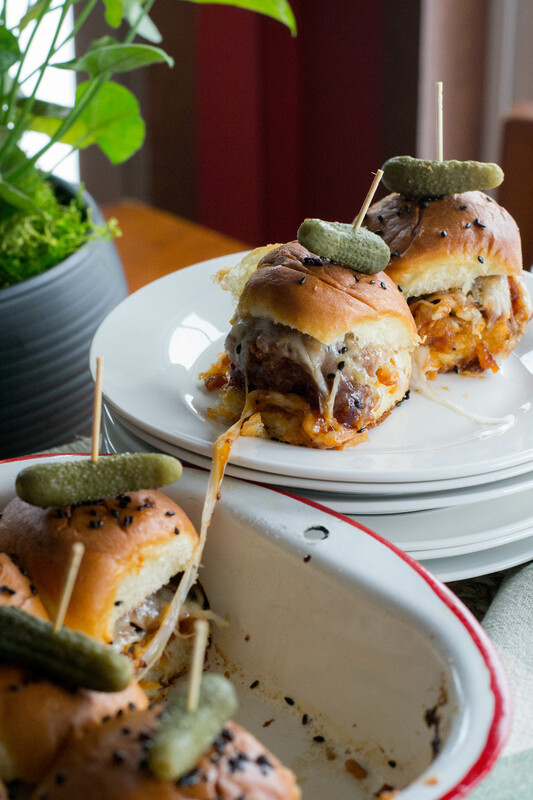 Some food fads never lose their steam, sliders are one of those fads. 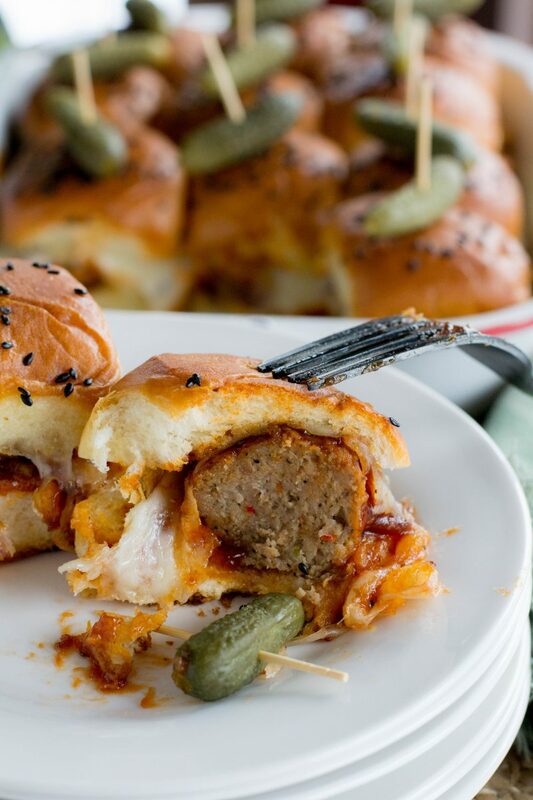 Sweet Spicy BBQ Meatball Sliders are my contribution to the slider game! Speaking of games…..they will score at your next football party. The playoffs are on and the Super Bowl is in the near future, You need a food game plan!! My first recipe for What the Forks for Dinner? was French Onion Soup. 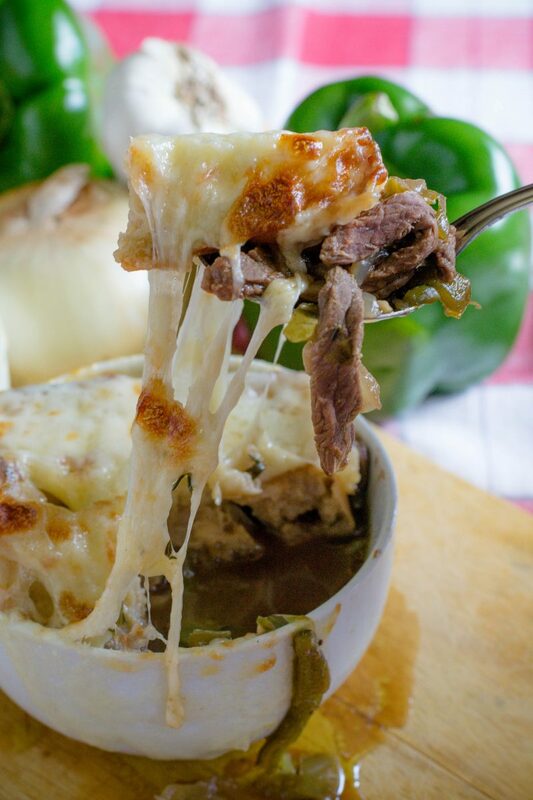 Philly Cheese Steak Soup is a take from that first recipe. When I posted that first recipe, I was in seventh heaven. It was the start of a dual dream for Tim and I. My love of cooking, his love of photography, and wanting to share those loves with each other and with others. 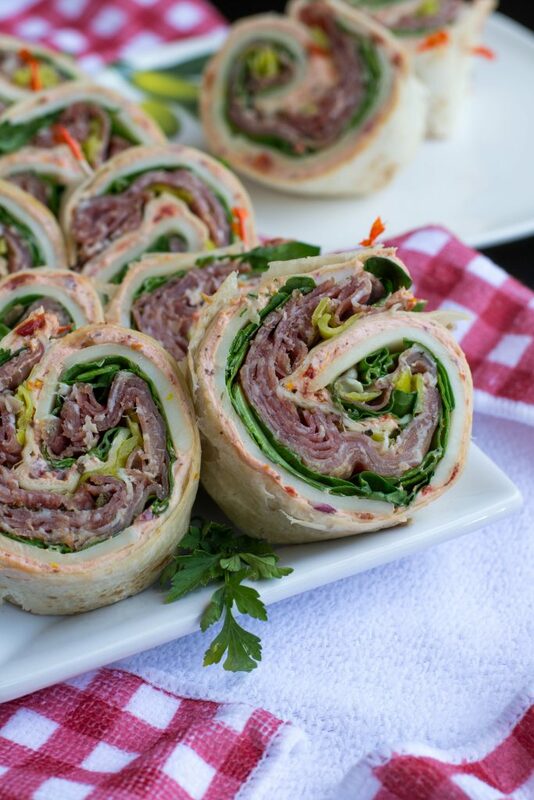 Pinwheels are a super popular appetizer and made in so many different forms. 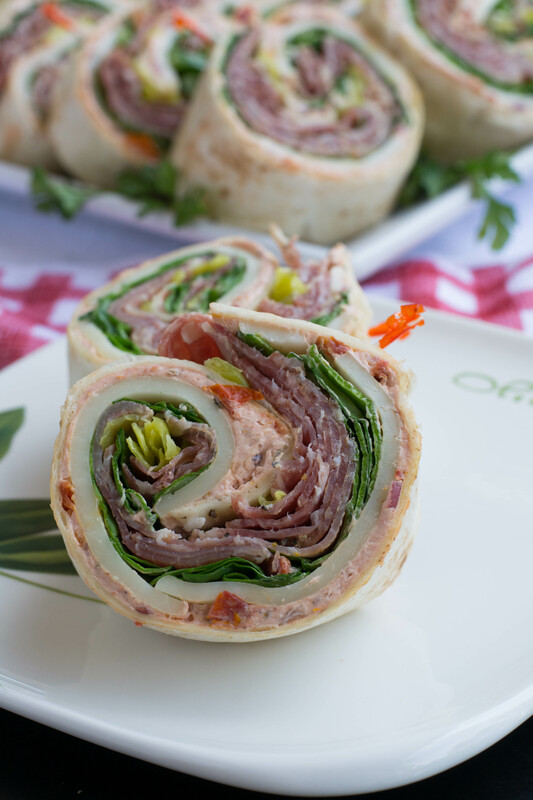 Antipasto Pinwheels are my version. Sometimes, I just like to have snacks for dinner. Especially on a warm summer night when you really don’t want to cook. A nice tray of Italian meats and cheeses……you know antipasto. Loaf of Italian bread, a glass of your favorite beverage…….kick back and relax. So, why not everything in a nice neat pinwheel? But of course……. 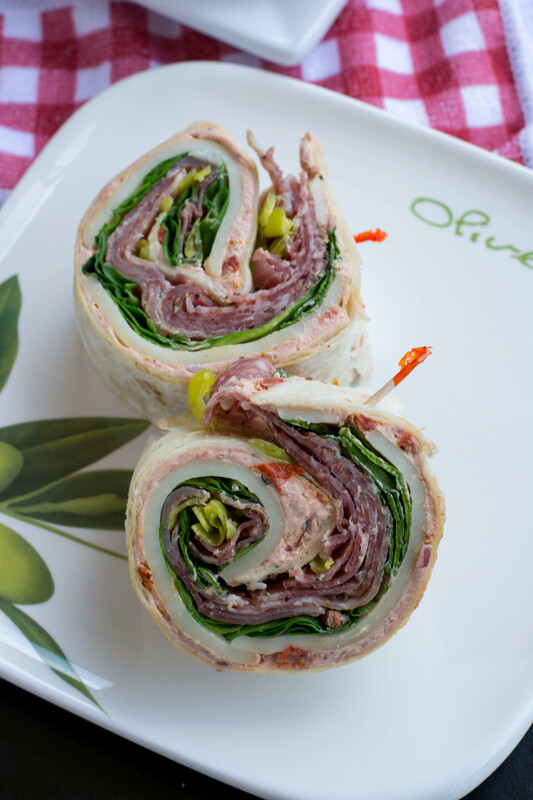 Flour tortillas spread with a cream cheese mixture loaded with sun-dried tomato, red onion, Italian seasonings, and black olive paste. I chose the paste so the mixture would be smooth, but you can use chopped black olives. You will need more than a teaspoon as the paste has a very intense flavor. A teaspoon of the paste sounds like a small amount but resist the temptation to add more or it will over power all the other flavors. 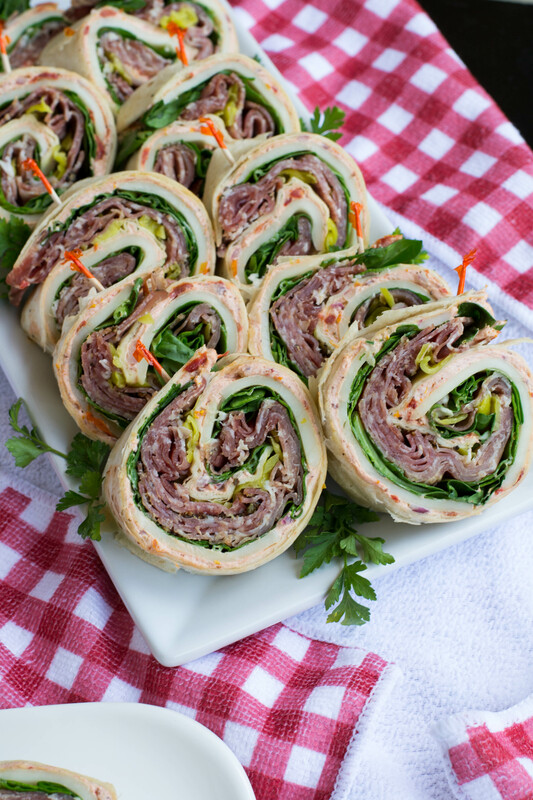 A package of assorted Italian meats pre sliced makes this so very easy….my mix had salami, prosciutto, coppa, and sopressata. A nice provolone cheese, and baby spinach on top of the meats for some greens. I like to use spinach as it doesn’t get as soggy as some lettuces will. Especially since you can make these ahead, store them in the frig until you are ready. 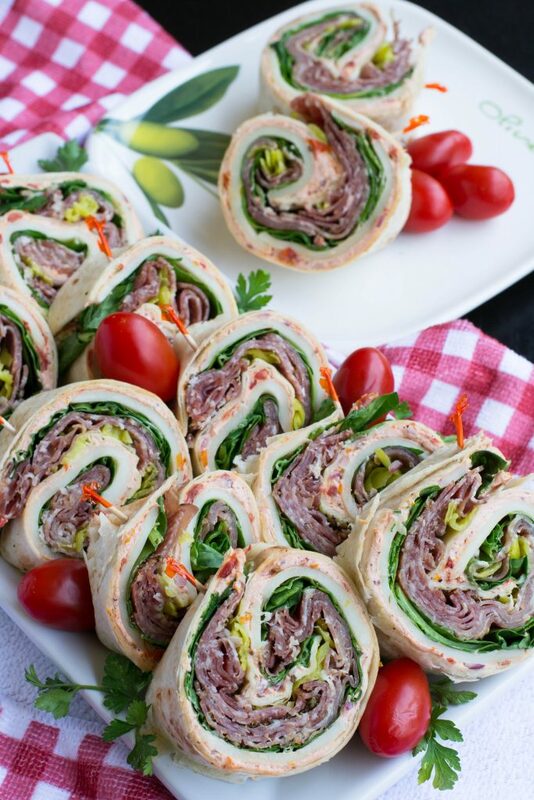 Roll them as tightly as you can and slice. I used frilly picks for a little something pretty…..we eat with our eyes! A nice white platter on top a red checked table cloth, your favorite beverage……maybe try our Pomegranate Mascoto Sangria, and your are ready for al fresco Italian style…….Antipasto Pinwheels. Spread half of the cream cheese mixture over one of the tortillas. Layer cheese, meat, and spinach, over cream cheese mixture leaving about 1/2 inch around the edge. Top with pepperoncini pepper slices to your taste. Roll up tightly. Cut into pinwheels securing with wooden picks. Refrigerate until ready to eat.